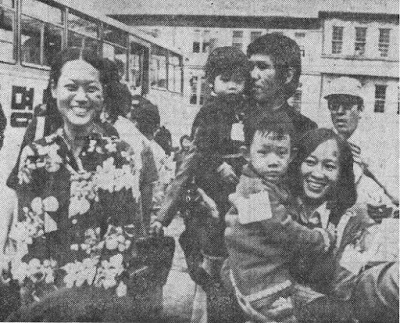 Last Wednesday the Korea Times published my latest article, about the arrival of Vietnamese refugees in Busan after the fall of South Vietnam in 1975. 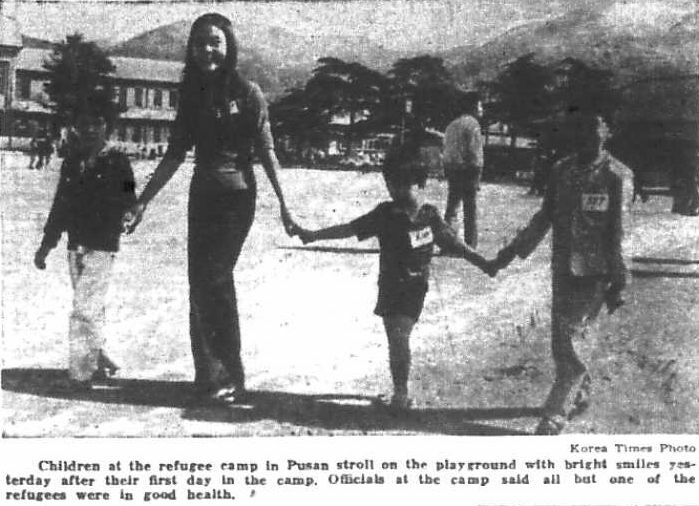 The article opens with a quotation from a July 2, 1975 Korea Times article by Pham Thudung commenting on her appreciation for the Korean Red Cross and the way it helped the refugees. 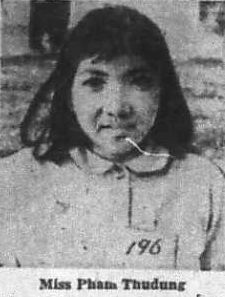 The rest of the article, however, was about the college junior's memory of leaving Vietnam, of how they did not have enough passes for their entire family, and her anguish at having to leave her brother behind. From the Korea Times, July 2, 1975. 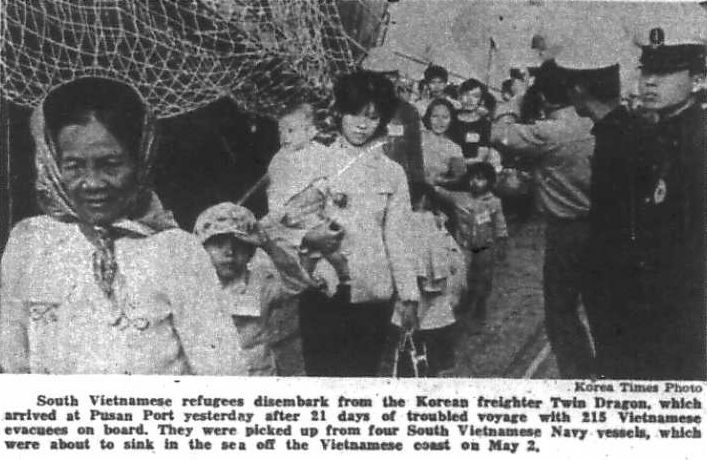 The refugees were carried from Vietnam by two ROK Navy LSTs on April 26, days before South Vietnam surrendered. 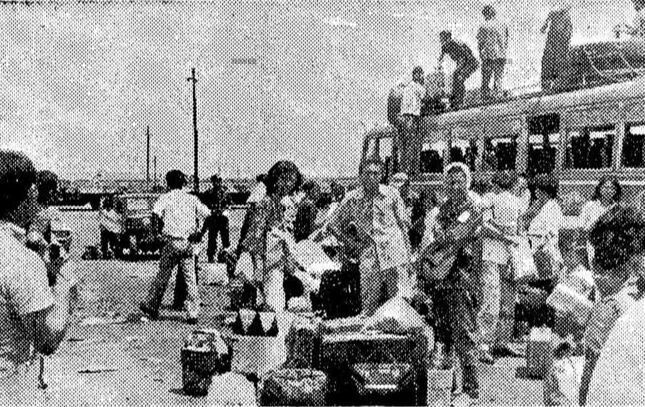 Photo by a crew member of one of the LSTs of Vietnamese at Newport Terminal, near Saigon, preparing to board the LSTs. 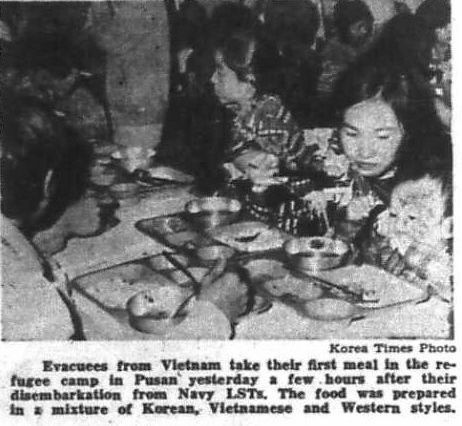 From the Donga Ilbo, May 22, 1975. From the Korea Times, May 6, 1975. 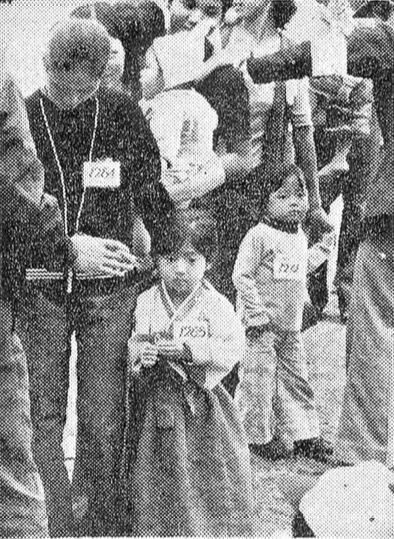 From the Kyonghyang Sinmun, May 7, 1975. "The former high school where refugees from Vietnam will be accommodated. Water tanks and tents have been prepared." 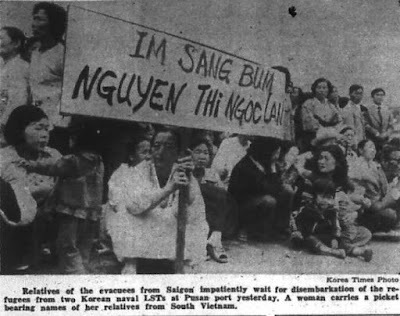 From the Kyonghyang Sinmun, May 12, 1975. On May 13, the two LSTs arrived in Busan. From the Donga Ilbo, May 13, 1975. "In the land of her father: First steps into a new life of freedom - A baby held by her mother stares with wide eyes at her father's country [followed by] happy children." 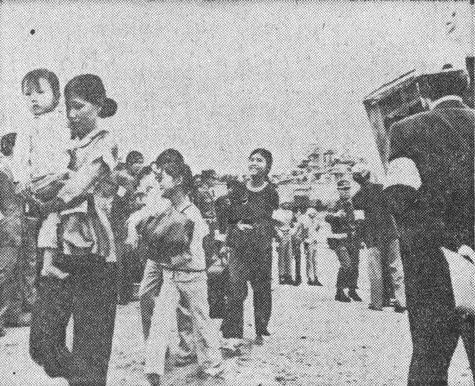 From the Kyonghyang Sinmun, May 13, 1975. From the Korea Times, May 14, 1975. Park Chung-hee had used the fall of South Vietnam as an opportunity to claim in a speech that Korea's situation was so precarious that urgent measures were needed. 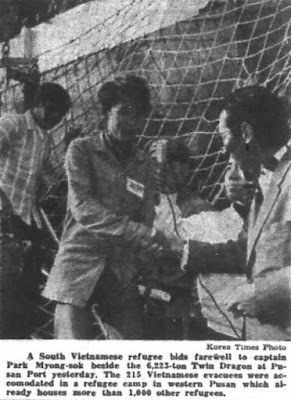 This came after Emergency Measure 7 closed Korea University due to protests there (many other universities were soon also closed), and Park urged students to pay attention to the fate of South Vietnam's dissidents. After a million-person rally for total national security at Yeouido, Park issued Emergency Measure 9, which banned all criticism of the government, among other things. 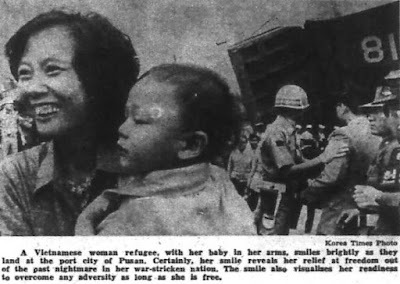 Returning to the refugees, according to a May 14 Korea Times article, Capt. Kwon Sang-ho, who was in charge of the ships, said they had originally left Busan April 9 with relief supplies for Vietnam and arrived April 22. 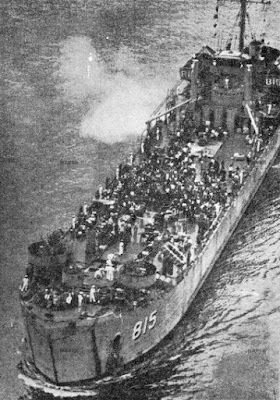 When the war turned for the worst suddenly on April 25, Korean ambassador Kim Yong-hwan asked the ships to load refugees. The LSTs first carried 1,908 refugees, but 567 Vietnamese were unloaded at Phu Quoc Island (near Cambodia) at the request of the Saigon government. On May 13, 3,000 friends, relatives, and others awaited the LST’s arrival at Busan port, including Busan’s mayor, former Korean ambassador to Vietnam Yu Yang-su, and South Vietnam ambassador to Korea Pham Xuan Chieu. After 17 days at sea, LSTs No. 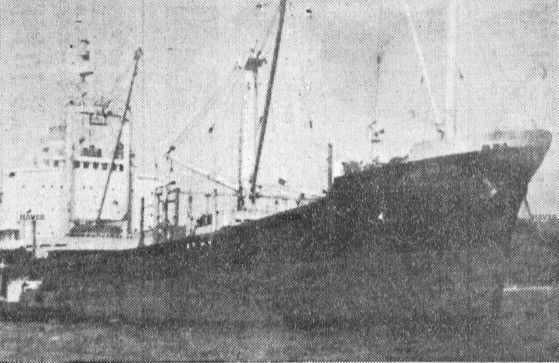 810 and 815 landed in Busan at 8:35 am on the 13th and began unloading the refugees shortly after 9:00. The refugees were made up of 355 men, 425 women, and 562 children. They included 392 South Vietnamese nationals who had no relatives or any other connection in Korea. They were all ushered into 31 buses and taken to the refugee camp. There was no welcoming ceremony on the pier due to security concerns, and no relatives or friends were allowed into the site of disembarkation. "At the refugee camp, the evacuees were accommodated in 43 rooms. Some 162 officials and workers are assigned to the refugee camp for treatment of the refugees. They include 25 officials of the relief center, four doctors, 11 nurses, 21 guards, two security officers, 15 Red Cross volunteers, two interpreters, 43 guides and 25 cooks." 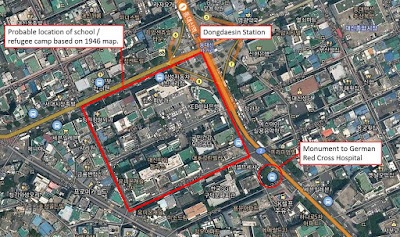 The Korean government was to spend 107 million won for the initial accommodation of the refugees, who were housed in the former Busan Girls' High School building in Seodaesin-dong. Those refugees with relatives or sponsors in Korea were to start leaving the camp on May 28. "Rediscovered smiles: After 17 days, Vietnamese refugees embraced by free Korea arrive at a medical relief station and seem to sigh in relief, unsure of what to do next." 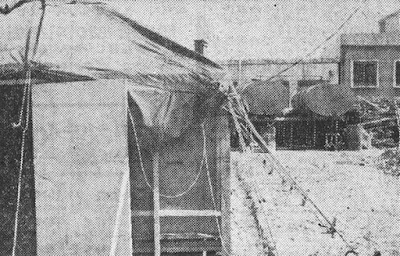 From the Kyonghyang Sinmun, May 13, 1975. "First breakfast in Daihan [Korea]." From the Donga Ilbo, May 14, 1975. This little girl seems prepared for Korea. From the Donga Ilbo, June 7, 1975. 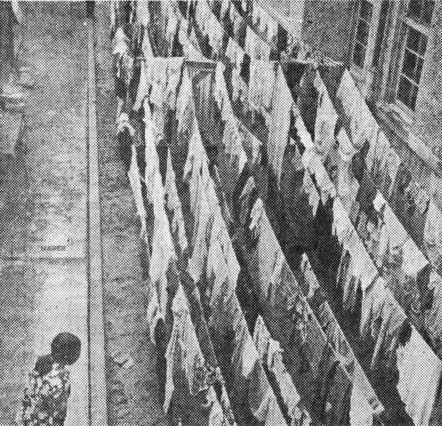 Laundry hanging at the refugee camp. 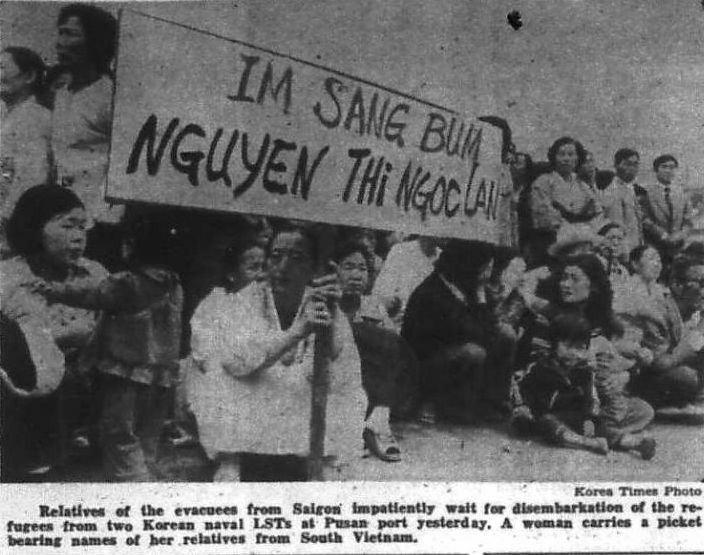 From the Kyonghyang Sinmun, May 14, 1975. Refugees exchange money at a bank counter (which appears to be in a bus). From the Maeil Gyeongje, May 15, 1975. From the Korea Times, May 25, 1975. From the Korea Times, May 15, 1975. From the Korea Times, June 6, 1975. 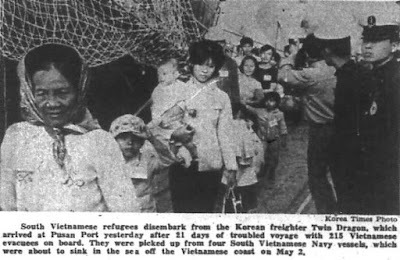 On May 23, 215 more refugees arrived on the cargo ship Twin Dragon, which had rescued them from four sinking South Vietnamese naval ships and brought them to Busan after Thailand and the US refused to accept them. 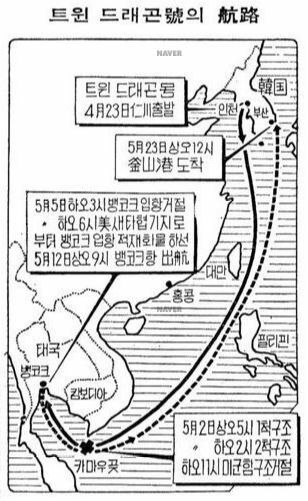 Below is the route of the Twin Dragon, which left Incheon on April 23, picked up the refugees on May 2, arrived in Bangkok on May 5, left Bangkok May 12, and arrived in Busan on May 23. From the Kyonghyang Sinmun, May 23, 1975. The Twin Dragon. 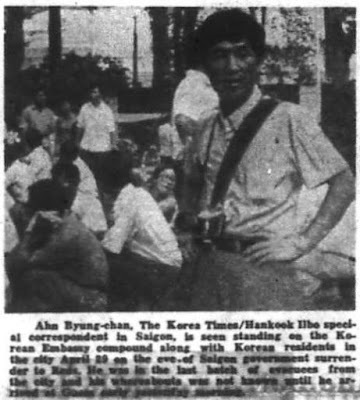 From the Kyonghyang Sinmun, May 22, 1975. From the Korea Times, May 24, 1975. "Vietnamese refugees arriving at the medical relief station. Embraced by the free land of Daihan [Korea], the refugees sigh in relief." 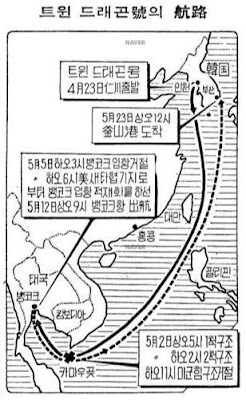 From the Kyonghyang Sinmun, May 24, 1975. 1,341 total; 988 Vietnamese, 33 Chinese, 1 Filipino, 319 Koreans. 546 Vietnamese were still in Korea: 473 who already settled with Korean relatives, and 73 without relatives to be settled in Korea the next day. 1004 already left. 1004 + 546 = 1,550 total. This corresponds with the revised number above of 1335 arrivals on the LSTs and 215 on the Twin Dragon. 584 Vietnamese settled in Korea out of a total 1,562, and 978 settled abroad. 78 (rather than 73) on settled in Korea on December 19. Needless to say, there is quite a bit of variation there. According to a December 9, 1975 Kyunghyang Sinmun article, the refugees received from the first day enough clothes, bedding, and three meals a day with often changing nutritious menus, and so had been warmly treated by the Korean government and citizens. The refugees had become so used to Korean food, one said, that it was hard to eat rice without kimchi. Beyond such self-congratulatory material, the article is full of information. As mentioned before, those with ties to Korea were able to leave the refugee camp from May 28, and by June many had expressed a desire to leave Korea. (According to this page, ultimately 697 settled in the US, 506 in Korea, 167 in Canada, 53 in France, 45 in Taiwan, and 14 elsewhere.) After so many refugees emigrated to other countries between May and September, the remaining 118 refugees were moved from the refugee camp at the school to a new one located in 12 classrooms of the former Police School in Goejeong-dong on September 23. 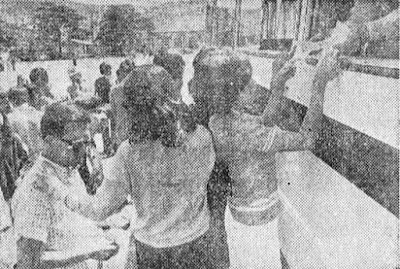 Those without relatives or friends in Korea or overseas to provide money had been given pocket money by the Korean Red Cross, and guides had taken them around the city. Many learned the streets well enough to go shopping in markets or department stores by themselves. At Chuseok, 63 Busan households invited the refugees into their homes to familiarize them with Korean customs and serve them delicious food. From October 1, a Korean teacher came and taught the refugees Korean from 9am to 12pm every morning. The authorities also took seven young men to the Korean-German vocational training center where they were taught electronic technology every afternoon from 1:00 to 5:00. 23 young women were likewise taken to a women's center every afternoon to learn dressmaking and knitting so as to help them to be able to make a living when they settled in Korea. According to Son Jeong, head of the refugee camp, he had received around 150 letters thanking the Korean government for its support, including 4 from Din, who had moved to Australia to work as a high school English teacher, and who said he thought of Korea as his second home. Seven children were born in the camp; two were named Busan, after the city that took them in. The remaining 73 (or 78?) refugees left in the camp moved to homes throughout the nation (except Jeju). As explained in my article, the Office of Labor Affairs arranged jobs for 56 of those refugees who settled in Korea at a variety of companies, including at factories, and the Ministry of Health and Social Affairs provided a subsidy to cover six months of living expenses. Many found adjusting to the cold winter weather to be a challenge. From the Korea Herald, December 17, 1975. 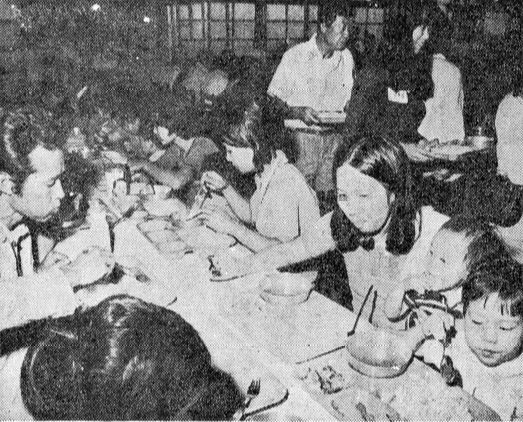 A few articles discussed their first Tet holiday in January 1976. From the Korea Times, February 1, 1976. And I always found this article about first Vietnamese restaurant in Seoul to be interesting. From the Korea Times, August 13, 1976. 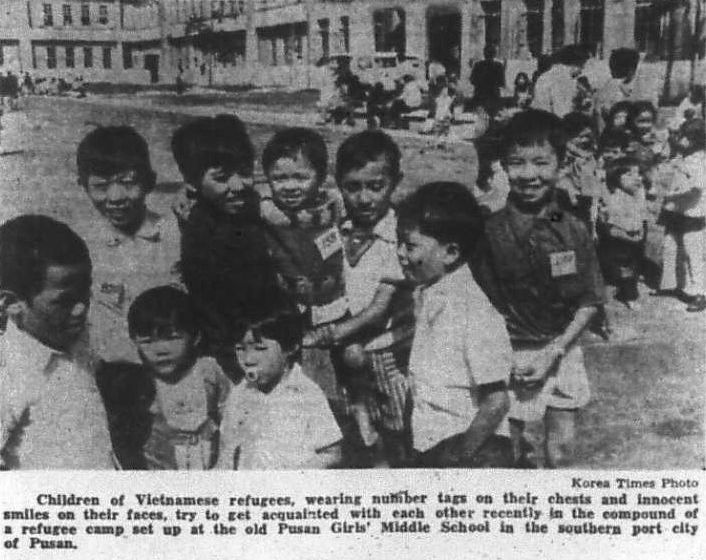 What happened to these Vietnamese refugees in Korea is a question that has crossed my mind more than once. 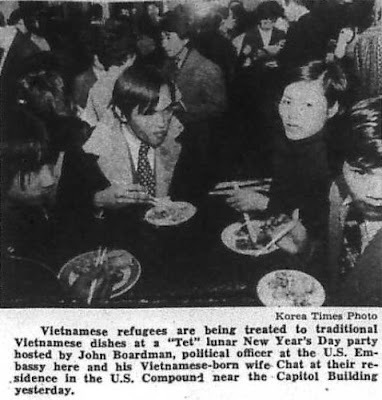 One article in early 1976 suggested they were just going to "become Korean" and blend in. Did their children face prejudice? One would imagine those who married into Korean families might have had an easier time, but it's hard to know for sure. I was contacted by one of the refugees who ultimately settled in the US, and he wondered where the refugee camp in Busan was. It has taken some searching but I seem to have found the answer. The aforementioned blog post also provided a photo of a stone monument erected in 1997 commemorating the German Red Cross Hospital. More information about the hospital can be found at this blog post, which includes directions to the monument. 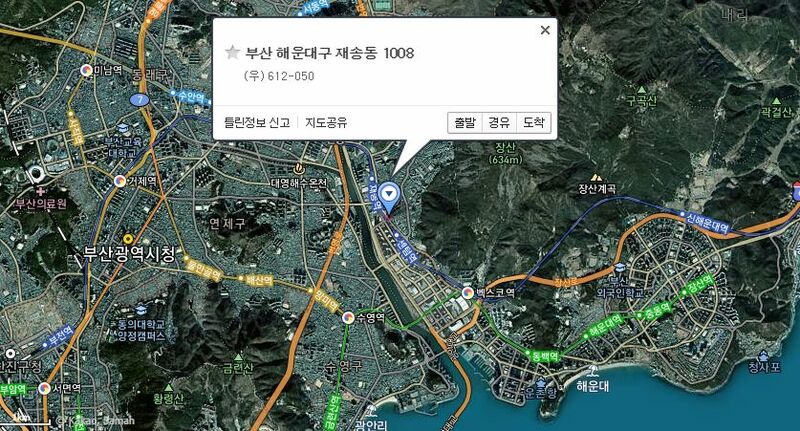 It can be reached from exit 8 of Dongdaesin station on Busan line 1. 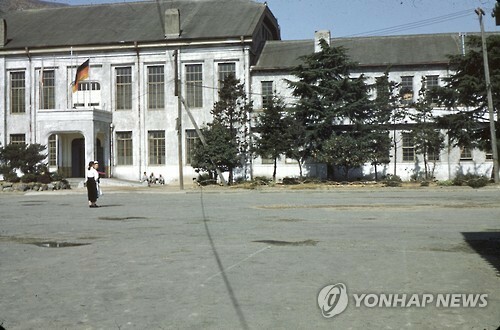 According to Busan Girls' High School's website, it was established in 1945 under the US military government and in April 1946 it moved to Seodaesin-dong 1 ga 53 beonji (서대신동1가 53번지). A US military map from 1946 shows Sunch'i Hospital (부산순치병원) at that location. 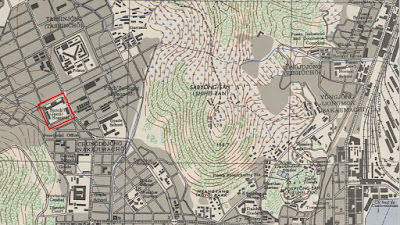 Because aspects of this 1946 map are based in part on a 1937 Japanese map, some parts of it could be almost a decade out of date. 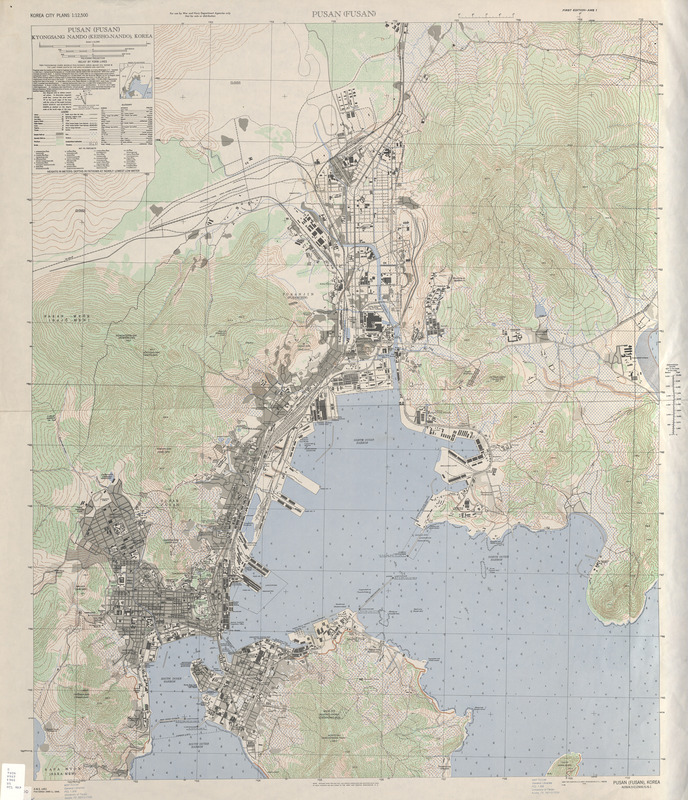 According to this page, the Japanese-established Busan City Hospital (부산부립병원) moved to a new location in 1936 (currently the location of Busan University Hospital) and at that time it merged with Sunchi Hospital, which was established in 1879 as Busan Isolation Hospital (부산피병원) in response to a cholera outbreak. 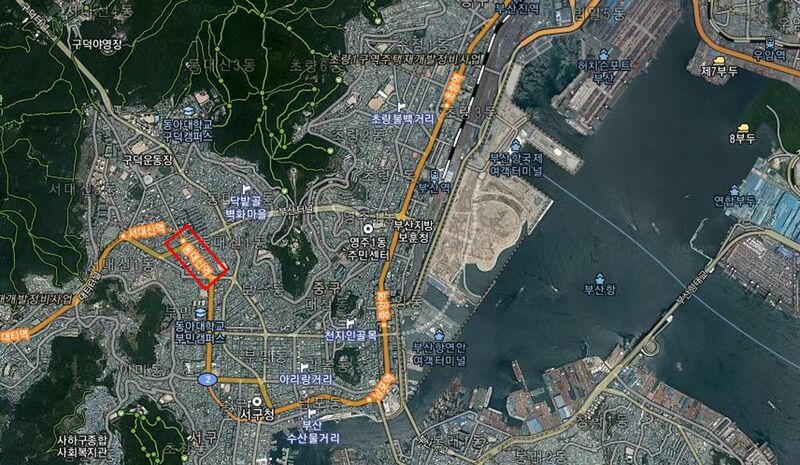 This merging with Busan City Hospital would have left the building open for use as a school in 1946. In early May 1975 Busan Girls' High School moved west to its current location in Hadan-dong, just in time for it to be converted into a refugee camp. Based on the above clues, this is the likely location of the former school / refugee camp today. (It should be noted that Goejeong-dong, the location of the former Police School where the remaining refugees were moved on September 23, was further to the west.) Unfortunately, but not unexpectedly, the school has disappeared and newer development has taken its place, with only the German Hospital monument located a block away there to remind people of its existence. That there is no monument to the refugee camp is not surprising; considering the growing importance of the relationship between Vietnam and South Korea today, a monument to the people who fled the current government would likely not be received with much enthusiasm by Vietnam. There are some odd connections to be made with the various institutions on the site of the refugee camp. It seems to have first been established as an isolation hospital in the late 1800s, only to become a place to 'isolate' refugees. More positively, it was the site of the German Red Cross Hospital in the mid-1950s, and the Korean Red Cross played a prominent role in operating the refugee camp for Vietnamese two decades later. 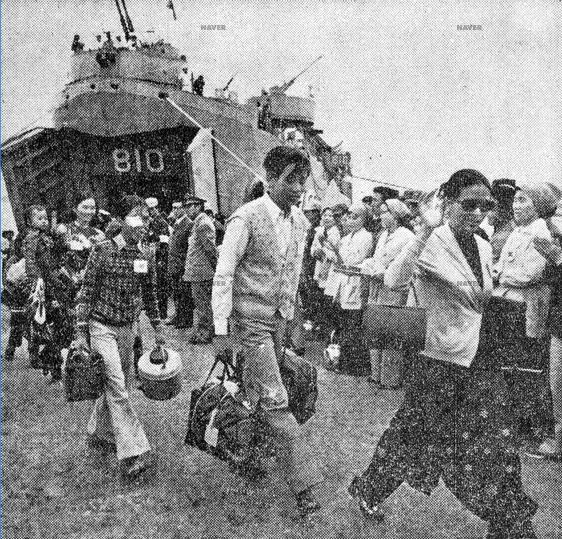 The ROK went out of its way to stop its ships from picking up Indochinese "boat people," firing a captain who did so and confining those boat people who did arrive to a newly built 'Vietnamese people’s relief center'. 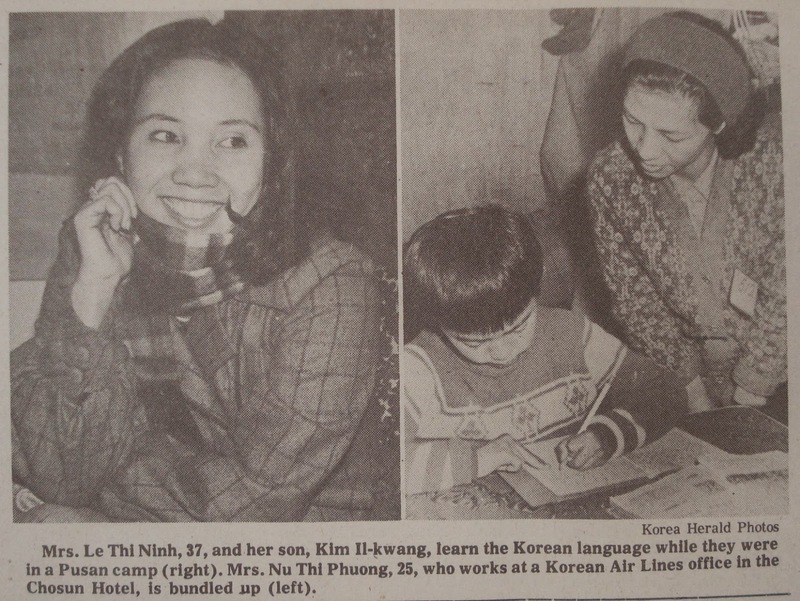 "Although criticized for such an approach (Koh 2011), officials pressed hard for third-country resettlement, and as a result, not a single Indochinese refugee who arrived between 1977 and 1989 was permitted to settle in South Korea." That Captain was Jeon Je-yong (전제용), about whom more can be read here (and here and here). According to this recent Yonhap article, the Vietnamese Refugee Center opened in 1977 at 1008 beonji, Jaesong-dong, Haeundae-gu (해운대구 재송동 1008번지), which at the time was near "Suyeong Airport, the former airport of Busan," which has since been developed into Centum City. The Refugee Center was closed January 29, 1993 after the establishment of diplomatic relations between the ROK and Vietnam a month previous. "Around 150 refugees who were unable to find a place to settle abroad were able to establish a new home in New Zealand due to the devoted efforts of American businessman John Manor [? 존 매너], then director of the shoe company, and his wife." South Korea's involvement in the Vietnam War highlighted ties going back centuries, helped kick start South Korea's economic development, left a legacy of brutality (which President Moon recently made a statement of regret for), and contributed to the establishment of the Yushin regime (see Tae-yang Kwak's work). 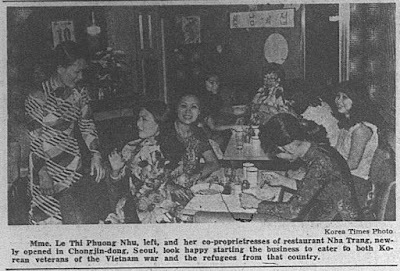 It also provided a number of human interest stories, such as the young woman who came to Korea in 1967 looking for the father she'd never seen, who met her mother when he was serving in the Japanese Army in Vietnam during WWII (and who married a Korean, the head of the Vietnam branch of Korean Optics, in Saigon the next year). Other stories refer to Koreans who had served in Vietnam during WWII in the Japanese army and who had stayed on and lived in South Vietnam for decades. 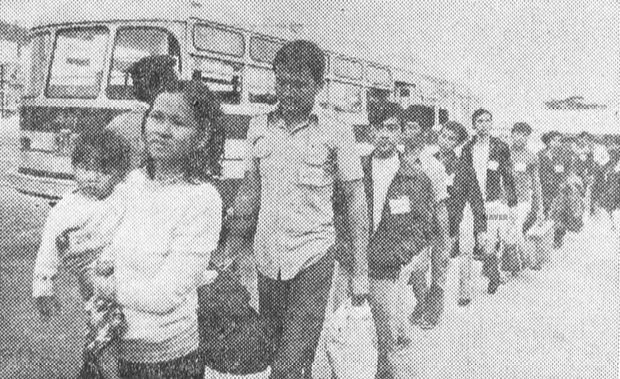 Beyond that, the Vietnamese refugees, especially those who stayed in Korea, were among the first foreigners in modern South Korea to be prepared to adapt to life in Korea by Korean authorities. One wonders if any of that educational material remains, and how it might compare to more recent cultural adaptation programs. Fascinating stuff, as always. Just last week I came across this video about the last refugees to leave Busan for New Zealand. The shot showing where they were living - Jangsan is prominent in the background - is now mostly skyscrapers. What a great find - thanks for that. According to Wikipedia, "South Korea and Vietnam established formal diplomatic relations on 22 December 1992," so that would be the reason the camp (established in 1977 as the 'Vietnamese refugee center') was closed. I'll update the post to add this. Arguing over Konglish in the 1960s.